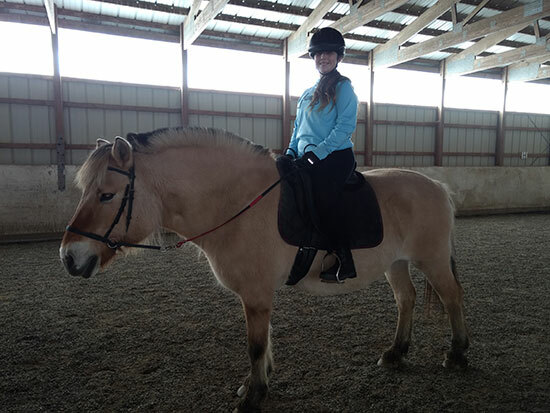 From the Ground Up has partnered with Elmcrest Children’s Center in Syracuse, NY since May, 2013 to provide therapeutic riding and groundwork as well as equine-assisted psychotherapy (EAP) for teenagers dealing with emotional and behavioral problems. Programs have included both individual and group therapy using the EAGALA model of EAP (described under Programs) as well as the youth’s intensive involvement with the horses in grooming, leading and riding, within the framework of Common Ground Horse Training. Elmcrest staff have reported significant positive results since the programs began, and formal evaluation of the various equine-assisted activities and therapies is underway. From the Ground Up (FTGU) partners with the School of Social Work and the David B. Falk College of Sport and Human Dynamics at Syracuse University. This collaboration includes a three-credit course entitled Introduction to Equine-Assisted Activities and Therapies. The course is open to both undergraduate and graduate students, and is currently being offered in summer (mid-May through the end of June) and Fall semesters. The course includes both a classroom session and an experiential component at FTGU’s facility in New Woodstock, NY. FTGU has also offered Continuing Education on equine-assisted therapies through the School of Social Work. Check News & Events on the FTGU website for information on the course and upcoming workshops. Special Olympics includes year-round sports training and athletic competition in a variety of Olympic-style sports for children and adults with intellectual disabilities, providing varied opportunities to develop physical fitness, demonstrate courage, experience joy and participate in a sharing of gifts, skills and friendship. From the Ground Up is a long-time partner with Special Olympics of New York, offering intensive training in equestrian events for FTGU participants who wish to have the Special Olympics experience. SUNY Cortland has the longest-running and most comprehensive recreation program in New York and is one of only three U.S. colleges with national accreditation in all four of its recreation majors. From the Ground Up has a mutually beneficial partnership with SUNY Cortland’s Program in Therapeutic Recreation whereby students receive Service Learning opportunities and FTGU gains needed volunteers and interns. Advocates, Inc. is a person-centered not for profit organization that empowers individuals with developmental disabilities to direct their own lives and create a vision for their future. They advocate for a future where people with developmental disabilities can fully participate in their home, schools, and communities in a meaningful way. From the Ground Up is proud to be a partner in their efforts, offering therapeutic horsemanship programs to individuals referred from Advocates.